Brush your teeth twice a day. Many people forget to brush the backs of their teeth or the area along the gum line, so be extra diligent about cleaning these areas. Floss daily. 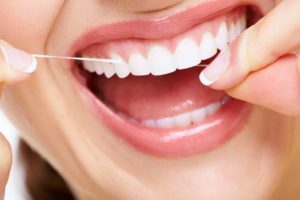 Floss can remove tiny food particles and plaque that accumulate along the gum line. Use an antibacterial mouth rinse. This is especially important for folks who are genetically predisposed to gum disease. Make an effort to quit smoking. Tobacco use is all-around bad for your oral health and has a strong correlation with gum disease. Eat a healthy diet. Some foods and drinks, such as apples, onions, and green tea, can help clean your gums and fight the inflammation that is associated with gum disease. Your gums are swollen, red, or tender. Your teeth look longer than they used to. You’re struggling with persistent bad breath. Your teeth are unusually sensitive. Even if you think your gums are doing fine, you should still see your dentist for a routine checkup at least twice a year. They’ll look for any signs of inflammation or gum recession and, if they notice a problem, bring it to your attention and suggest a treatment to get your oral health back on track. Sometimes, beating gum disease is as simple as making a few adjustments to your daily oral hygiene routine. In other cases, periodontal therapy in Waco (such as a course of antibiotics or a deep cleaning of the mouth) may be necessary. Your gums are an important part of your smile! This September, give them a little extra attention so you can continue to enjoy a fresh and healthy mouth. Dr. Rick Cofer is a Texas native who enjoys caring for the oral health needs of familes in Waco. He helps his patients to fight gum disease through preventive care, deep cleaning, and other treatments. If you are concerned about the state of your gums, contact our office at 254-732-0309 to schedule a checkup. by: Dr. Rick Cofer at September 13, 2018 .